UK Prime Minister Theresa May will address lawmakers in the House of Commons on Tuesday as she seeks more time to renegotiate her Brexit deal with the European Union. Four weeks after she saw her agreement with the bloc defeated by the biggest margin in modern Parliamentary history, May met with MPs from across the political divide Monday as she continued to seek a deal that can win a majority in the House of Commons. 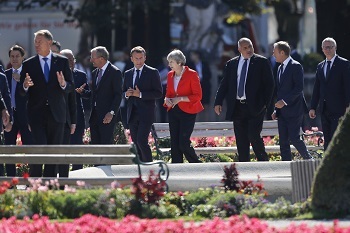 After buying time two weeks ago, when she won a vote giving her the mandate to reopen talks with the bloc, the embattled premier is expected to ask Parliament to restate its demand to remove the backstop from the Withdrawal Agreement and to promise a further vote if she hasn’t brought a renegotiated deal back to Parliament by February 27. Brexit Secretary Stephen Barclay traveled to Brussels for talks with the EU’s Chief Negotiator Michel Barnier on Monday evening to try to find a way out of the impasse. The European Commission said the two men discussed the "urgent" need to find a solution that satisfies the other 27 EU member states and can win a "strong" majority in Parliament. “It’s clear from our side that we’re not going to reopen the Withdrawal Agreement, but we will continue our discussion in the coming days,” Barnier told reporters after the meeting. The EU negotiator said earlier that clarity on the next steps would have to come from London.